Sing Street (2016) is a coming-of-age story set in Dublin in the 1980s. Directed by John Carney and starring Ferdia Walsh-Peelo and Lucy Boynton, this film tells the story of a young boy who sets up a band to impress a girl. Through his music, he is able to express the issues that he has in his family and school life, all while making great songs and living his fantasy life. John Carney is one of those directors who have a central theme when it comes to his films. Just like another major director, Damien Chazelle, his films are centred around the love of music. Not making a typical musical, but showing an appreciation and love for what music does to people. I have not seen his other films, but I have heard fantastic things about all of them. I have heard so much praise for this film ever since it was released. I have been wanting to watch this film for a while now, but I had never found the time to be able to watch it. This is exactly the same situation that I had with another music-based film, Whiplash (my review of Whiplash can be found here). Both of these are films that I took years to watch, and yet I knew that I would love them. And that is exactly what happened. Sing Street is an incredibly touching film that somehow manages to balance humour and drama at the same time. It is incredibly rare that a film will manage to make me laugh and cry at the same time, and yet this film succeeds in this. This is down to the story and how the film was written. Carney's screenplay is incredibly simple in the plot, yet complicated down to the character development. It feels real, yet also has glimmers of fantasy. The character development is also driven by the performances given in this film. 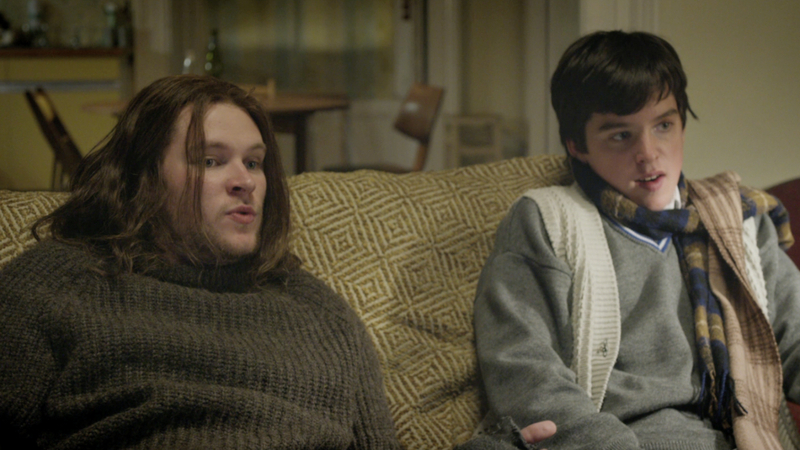 Ferdia Walsh-Peelo (Conor) has a fantastic debut performance here, and he really is the star of the film. Whilst his vocals isn't perfect, it fits with the story of a 15-year boy developing his love of music. This casting was a fantastic choice, as it makes the story feel even more real. Walsh-Peelo is a fantastic actor and I hope that he gets to do more stuff from this. This is also a big break for Lucy Boynton, who only really did TV series up until this point. Her mysterious personality stands out, and her quirkiness makes you realise why Conor is attracted to her. Special shout-out also has to go to Jack Reynor, who plays Conor's brother Brendan. This is possibly one of the best brother portrayals that I have seen on film, and you really see how the two brothers connect and relate to each other. This film deals with several issues, and a major one has to do with religion. With the setting being Dublin in the 1980s, this was a major point for Irish history when the recession hit families. Due to this, the first plot point comes at the very start when Conor has to move from a private school to a public school. This affects Conor hard, as he goes from the comfort of private to public and has to learn to make do. We don't even get to see Conor in the private school, but we can see that the change is uncomfortable due to the scenes in his public school. This causes conflict between Conor and the head teacher, who is incredibly awful to watch as he destroys all of Conor's confidence and beliefs. This also links with the issue of Catholicism, and how the religion can affect families. Whilst this film doesn't shy away from talking about the religion, this also develops into the family issues that occur in the film. This makes the film seem even more real, as the film deals with real-life situation and doesn't glamourise them. These issues also help develop the connection between the brothers. The ending of the film, whilst I will not spoil it, is definitely a great way to end it. There are multiple ways of interpreting it, and it is interesting to see if people take it metaphorically or literally. John Carney even commented on the ending with a quote, which I will link to here. Overall, I highly urge everyone to watch this film. It will not annoy the people who dislikes musicals, yet will be a fun film to everyone to watch. It will make you laugh, it will make you cry, and I think I may have found a new director that I will fall in love with. I wish a few characters were more fleshed out, like the sister for example, but otherwise I love this film and I can't wait to watch Carney's other films. Have you seen Sing Street yet? What did you make of it? Let me know in the comments below and I will make sure to get back.